I have discussed driverless trucks before, but the timeline keeps speeding up. Self-driving trucks before the end of this decade used to seem like a remote possibility. It now seems very likely, if not a given. Moreover, driverless truck convoys will be safer and more fuel efficient than human-driven trucks. Tech Hive reports The First Driverless Cars Will Actually be a Bunch of Trucks. The future of driverless driving is all about trucks. So forget about that sensor-equipped Volkswagen Passat, and get ready for a 40-ton Peterbuilt 18-wheeler. In the wake of new U.S. Department of Transportation guidelines for automated-vehicle testing, experts such as Ümit Özguner, a professor with Ohio State University’s Center for Automotive Research, are predicting that the first wave of operational autonomous vehicles will be devoted to long-haul deliveries. This is about moving cargo, not people. [above]: A Japanese government research program is now testing driverless truck convoys that are designed to improve fuel economy. In late May, the U.S. Department of Transportation opened the door for road-testing self-driving trucks by publishing policies for the three states that currently allow driverless vehicles: California, Nevada, and Florida. These guidelines open the door for driverless tests of all kinds. 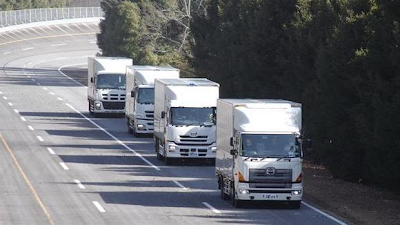 Overseas, meanwhile, experiments with driverless truck convoys—also known as “platoons”—have been under way for years. In the coming years, car manufacturers will continue to introduce incremental, semiautomated technologies designed for situations that don’t require interacting with too many other drivers (examples already include automated parallel-parking systems and cruise control). Flores told TechHive that before the end of the decade, GM hopes to release a technology called Super Cruise that will marry adaptive cruise and lane controls, and will allow any vehicle to safely navigate itself over long stretches of highway. Supply Chain also says Trucks Will Drive Themselves Before Cars Do. Driverless truck experiments are already underway in Japan and Europe, and now testing of semi-autonomous trucks has begun in Nevada. Here are the reasons why they’re destined to succeed — and why you’ll probably pass a driverless semi before you ever see a self-driving car. The most immediate reason why driverless technology will doom truckers is the same reason it’ll be the end for cab drivers: the cost of a machine operating a vehicle will be dramatically cheaper than the cost of a human. One of the things that drive up the cost of drivers is the simple fact that long-haul trucking is a much more unpleasant lifestyle than driving a cab. Many drivers spend five or six days a week on the road, which is why trucking has such an extraordinarily high turnover rate (about 98 percent annually) and why the industry constantly struggles to find enough drivers, even when unemployment is high. Obviously, machines won’t care about these lifestyle difficulties. In fact, the Australian mining company Rio Tinto has already begun implementing autonomous trucks at its remote iron ore mines, partly because it’s so expensive to get drivers to come live in those places. Engineering a vehicle that can drive at a constant speed on a predictable highway is a much simpler problem than designing one that can drive on city streets, which are filled with traffic lights, pedestrians, and other sudden obstacles. Between 20 and 40 percent of the cost of shipping something by truck goes to fuel. A large amount of this fuel is simply burned as the engine fights air resistance, because trailers are so boxy and unaerodynamic. One way of cutting down on it is driving trucks in tight packs, so one can draft behind another. Of course, it’s not safe for human drivers to draft off each other in this way, because it doesn’t allow for enough reaction time if the truck in front stops suddenly. But computers can do it, and recent tests in Nevada showed just how much fuel they can save. The experiments by Peloton, a company that’s developing truck caravan technology in partnership with the Department of Transportation, showed that while traveling at 65 miles per hour 36 feet apart, two trucks packed together saved seven percent on fuel. This was the average for just two trucks (the lead saved 4.5 percent, and the rear saved 10 percent), so it should increase as trains get longer. What Obstacles Need To Be Overcome For Driverless Trucks? The factors that block a broad rollout of self-driving trucks fall mainly into two categories. One is safety. People are understandably concerned about the idea of computers driving cars around on the roads, and those worries are amplified for tractor-trailers that can weigh up to 80,000 pounds when fully loaded. But experts actually predict that automated systems will make trucking safer, by eliminating distracted driving and human error. And Google’s driverless cars, at least, have now gone more than 700,000 miles without an accident. The other problem is legal. Right now, just a few states (including California, Nevada, and Florida) have laws on the books regarding driverless cars, and their legal status as a whole is murky. For driverless trucking on Interstates to be practical, all states would need to explicitly allow these vehicles on public roads. Advocates are hopeful that national legislation will solve this problem. It’s all very uncertain, but in 2012, Google’s Sergey Brin predicted the Department of Transportation would begin regulating autonomous vehicles nationally as early as 2017. I first wrote about driverless trucks on August 5, 2013, in Message to 5.7 Million Truck Drivers "No Drivers Needed" Your Job is About to Vanish. On May 25, 2014 I discussed "last mile" and objections by truck drivers in denial about what is going to happen. Let's assume someone has to load the truck. Let's also assume an actual skilled driver has to dock the truck and make the final delivery (arguably a bad assumption). Driverless trucks are looking more and more likely before the end of the decade. Millions of jobs will vanish when it happens.